Full Moon Bites: The Carny by Brooke Moss Release Day Party! 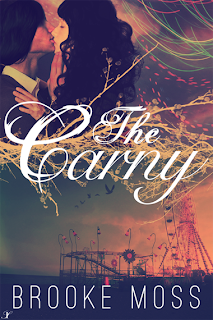 The Carny by Brooke Moss Release Day Party! "Brooke Moss is a gifted storyteller. With a compelling plot and characters who will steal your heart, The Carny is a winner." -- Cate Lord, author of Lucky Girl. His lips touched mine before I could agree with him. They were soft and full, and tasted faintly of the soda pop he’d been drinking." Heart was in my throat. It was a sloppy kiss lol.